Who can fit two 42-inch TVs in their house? After showing off the massive 108-inch high-def TV at IFA 2007 a couple of months back, Sharp has launched the world's smallest full high-definition 22-inch and 26-inch LCD TVs this week. The new AQUOS P series TVs feature a 1920x1080 full HD resolution. The 22-inch LCD boasts a 1200:1 contrast ratio; the 26-incher a 1500:1 contrast ratio. It's a response to a buying trend that shows that larger-sized high-definition TVs (40 inches and up) aren't selling as well as Sharp had hoped. 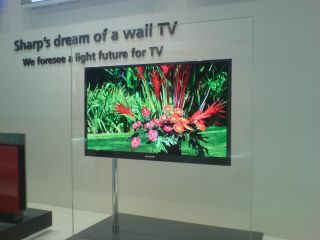 Sharp plans to focus on making more of these smaller high-def models instead. While LCDs and plasma TVs have become bigger and cheaper over the past few years, it appears that consumers aren't loving tellies bigger than 32 inches. According to Sharp, smaller high-definition flat screens are in big demand. The firm said it would still produce 40-inch and 50-inch televisions but that sales of such models had "nosedived" in the US market since July, the Financial Times reported. "The 32-inch gaming model was very popular and demand was greater than we expected," Toshihiko Hirobe, a corporate director at Sharp, told the FT. "At first, we were a little sceptical that there would be so much demand for smaller high-definition TVs." This growing trend for smaller sets might not come as a surprise. You only really need one big LCD/plasma as your main TV. You're hardly likely to spend big on a second big screen. Demand for smaller 32-inch TVs probably shows that consumers are shopping for second TVs, suitable for bedrooms and kitchens. Sony said last week that it will also focus more on its smaller LCD TV line-up, adding new products in the coming months.